There is a new framework and assessment tool that explodes the innovation potential of individuals and teams. Game Changers do not change the game on their own. 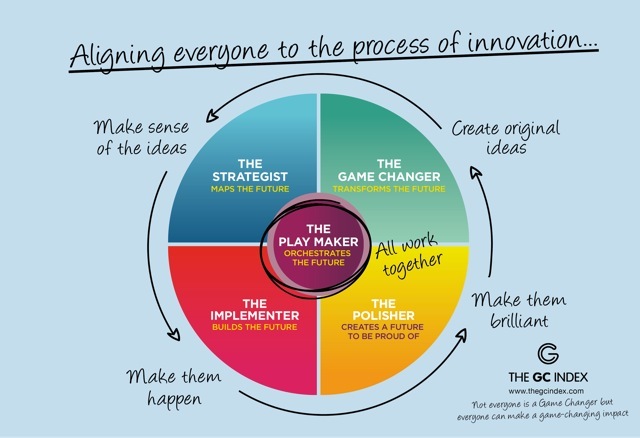 2015 research into the DNA of Game Changers and Game Changing Teams shows there are four roles in addition to the maverick Game Changer. We need the input of all five roles. And The GC Index®, a 59-item, strengths-based online questionnaire, can measure and grow each of them. Developed by leading psychologists Dr John Mervyn-Smith & Dr Adrian Furnham, the Index measures impact – a preferred way of contributing – and tells us which of the 5 roles of Game Changing teams we play. It takes only 10-15 minutes to complete, and provides individual and team profiles to steer innovative outcomes in personal professional contexts or as a collective within a business / organisation. How are we using the GC Index®? Build individual influence and impact – at all levels. Order and pay for your profile. You will be sent a link to complete The GC Index®. We will then schedule your coaching feedback sessions. Feedback sessions unpack your optimal impact at work or in your business. We cover aspects of leadership, engaging and influencing, contribution to creativity and innovation, who to surround yourself with, and how to focus your energy to thrive rather than just get by. The time for fitting square pegs into round holes is over. Discover and strengthen your impact. WE ALSO WORK WITH TEAMS AND GENERATE TEAM PROFILES. *Coaching sessions are scheduled at our private offices near Waterfall (Kyalami), or at your offices in Gauteng. You can select a Skype feedback session. Work with teams is delivered in-company. Add the GC Index to your toolkit. We accredit practitioners locally. Drop us a note below.